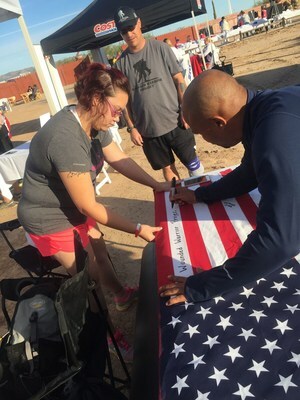 CHANDLER, Ariz., Dec. 21, 2016 /PRNewswire-USNewswire/ -- During a recent Wounded Warrior Project® (WWP) program event at Rawhide Western Town in Chandler, Arizona, a group of injured veterans joined Rally Point Arizona for a 5K run to honor fellow service members. As participants ran and volunteered, they experienced what is possible at social gatherings that connect them with other wounded warriors and family members. Marine veteran Janelle Happersett was happy to be a part of something that honored the nation's veterans – an experience made all the better with the support of family. "Wounded Warrior Project gives me a healing outlet by providing situations that bring veterans together socially," she said. "We get to meet people to support us on our journey. These activities allow families to spend time together outside of the house, creating memories and forming new bonds." Attendees cheered on the veterans who hiked 22 kilometers (a little more than 13.1 miles, just over a half marathon) to raise awareness about veteran suicide. While a Department of Veterans Affairs study estimates the number of veteran suicides has improved from 22 to 20 per day, this event was held to raise further awareness of the problem. Wounded warriors who did not participate in the 5K volunteered at the run's various water points. These connection events support the long-term recovery needs of warriors by reintroducing them to the unique bonds experienced during military service. Socialization – in environments that accommodate physical injuries and social anxieties – can go a long way toward reducing isolation, which can be detrimental to the recovery process. "My 11-year-old son, Shaun, loved all of the activities and the live music afterward," Janelle said. "The experience gave me a sense of camaraderie again – and pride in being a veteran." Physical activity and socializing with other veterans can help injured warriors cope with stress and emotional concerns. In a WWP survey of the injured warriors it serves, more than half of survey respondents (51.7 percent) talked with fellow Operation Enduring Freedom, Operation Iraqi Freedom, or Operation New Dawn veterans to address their mental health issues, and 29.6 percent expressed physical activity helps. While many aspects of the day were enjoyable, Janelle said it was equally important to be a part of the event because it shed light on veteran suicide. "Events like this can be a system of support for warriors if they or another veteran family member has struggled with suicidal thoughts or issues in the past," she said. "It reminds us to take care of our veterans, and to be aware of the problems we're facing together." For Army veteran Toni Grimes, raising awareness was the motivating factor in her decision to participate in the outreach event. She said veteran suicide is an issue that hits very close to home. "I tried to commit suicide four times while on active duty," Toni said. "Luckily, I was able to get the help that I needed to get better. I want to spread awareness so my fellow warriors can get the same assistance." Due to a knee replacement, Toni was only able to walk the 5K. Still, she credits WWP and its physical health and wellness programs for giving her the tools to lead a happier, healthier civilian life. One of those programs is Soldier Ride®, which is a cycling event that gives participants a chance to heal their bodies and minds. "Wounded Warrior Project has been a godsend to me," she said. "I'm about to ride my first 100-mile cycling race. I'm taking kickboxing classes twice a week. I have so many opportunities to try something different and outside of my comfort zone." WWP staff members interacted with attendees throughout the day, advising them of additional services and personalized therapeutic outlets to assist in their recovery processes. The programs assist injured veterans with mental health, physical health and wellness, career and benefits counseling, and connecting with other warriors and their communities. The generosity of donors allows warriors and family members to benefit from WWP's outreach events and program resources at no cost to them.